A Radiophonic Workshop-style synthesist’s delight, fusing a fully polyphonic Korg 770 to a selection of sophisticated controls • ‘External Input’ module brings complex waves from other Korg machines into the signal path: dial up the sounds of the Lambda, PolySix and more! • Faithfully-modelled vintage Traveler circuit for eerie, resonant band-pass filtering • ‘Virtual PWM’, five separate filters, Scale noise, three oscillators + sub… • 40 factory patches and the ever-popular Glitch control to make rolling your own as easy as clicking a button! This all came about because we fell in love with our Korg 770. 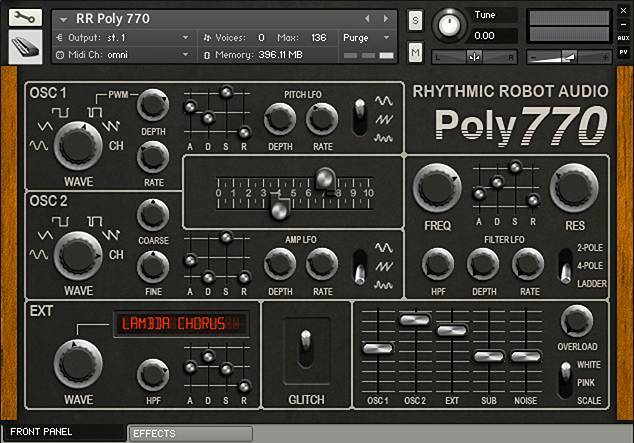 The 770 is a wonderful little synth – quirky, imaginative, oddball, strange in all the right ways. Fundamentally it’s a twin-oscillator monosynth with the usual waveforms and a fairly standard control set (although there’s a ring modulator, which is a little unexpected and very welcome)… except for three significant differences that really set it apart from the crowd. First, the “Traveler”. This is Korg’s name for the filter, and it comprises a cool arrangement of high-pass and low-pass circuits which are ganged together so you can either use them independently or as a band-pass. They’re linked to some very leftfield contour generators. Sometimes what comes out isn’t what you were expecting, but overall, it’s great. Thirdly, there’s the Chorus wave, which is a detuned sawtooth; again, here you get instant warmth without even accessing Osc 2, which is a godsend. All in all, the 770 is just a ton of fun in a tiny little package, and we think the world of ours, especially the sound (which is kind of grainy and airy and quite unlike a lot of other synths). So the big question was: how to set it free in software? The answer became a bigger and bigger project the more we got into it. As well as sampling and recreating the Korg’s oscillators, we convolution sampled its weird and wonderful Traveler circuit, so you can hear exactly what that oddball cluster of components does to the sound. We recreated the PWM in software so you can get evolving, developing textures out of it. And then we went a lot further. The hardware 770 has an External Input, which is great for running other synths in tandem through the Korg’s signal path, so we thought – why not do that here, too? We’ve built in an External section which gives you access to 25 multisampled sounds from outside the 770: things like Lambda strings and brass, PolySix pads and chorused sweeps, even a second subtly detuned 770 programmed with particularly useful sounds designed to blend with your basic waves. Yep, these are all Korg machines, which is entirely deliberate: we wanted a “family sound” going on here, so we stuck with the same DNA throughout the machine. Roping these additional sounds into the mix really expands and enhances the palette on offer and gives you some instant weight and richness to compliment the 770’s grainy grit. (All our Kontakt instruments require a full copy of Native Instruments Kontakt v4.2.3 or higher (including all versions of Kontakt 5). Kontakt Player is not supported: instruments will load, but will time out after 15 minutes. See the FAQ for further information.) You can read more about the original Korg 770 here. 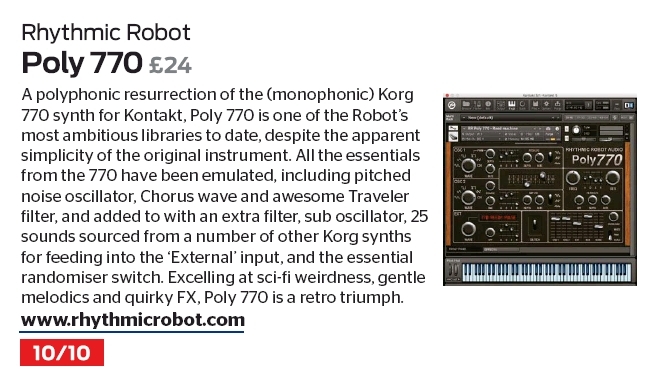 I expected this to sound like the Korg 700(S) or the 800DV, because they also have the chorus wave and a “traveler”. Turns out it does not sound like a 700, this sounds more like….. like nothing I’ve ever heard! The sound is gritty, very mid focused and perhaps a bit thin on its own, but that is where the external waves and sub oscillator come in handy. My only gripe is that the traveler can’t be bypassed from the interface, it’s pretty resonant and unique sounding and sometimes bypassing it is the way to go. (Especially for bass sounds). Really nice work but It would be great to have on board also a fully reproduction of the original Korg 770! Initially I got put off as the traveler filter is notched, not smooth – but then I guess that’s due to it being sampled, not linked to the filter in kontakt…there are separate cut off and res controls for the smooth transition stuff. Never played a 770 but do have an 800DV, with that traveler on it. Can’t say this sounds as big as THAT exactly but with the external sound sources and sub, its more varied in what it can do. An interesting Kontakt “analogue synth” with a unique and very usable sound, which is the main thing. There’s something weird and wonderful about this one! 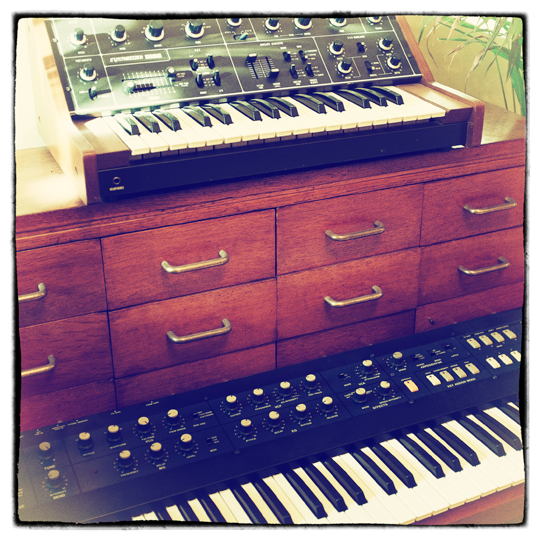 Not a Minimoog not an Oberheim SEM, something in between! Excellent emulation by the Rhytmic Robot guys. Especially the additional waveform is such a cool feature since you can add lots of energy by stacking and overloading things! I’m blown away by the unique sound of this synth. Instant inspiration. I think I’ve purchased about 20 instruments from these RR in the last month. Tons of truly addictive, superb instruments. If you need a synth that has actual grit & funk, look no further. This is a bad mofo for that sizzle that you need. The scale noise is perfect for making pads or FX. Having a sub oscillator is a godsend on a synth that concentrates so much on the middle frequencies as well. 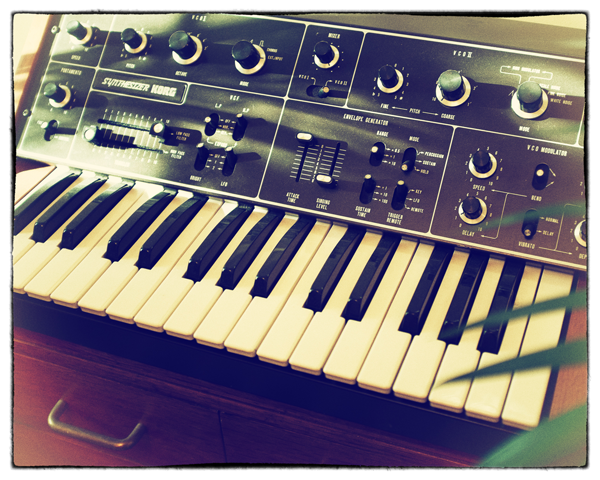 A great lil synth for filling in that sonic space that you need if you don’t have it….pitched warm noise! Another plus to he team at RR! Instabuy! Of that funky shiz from Guy. Plus Mongo. I love the Radiophonic weirdly idea mixed with analogue goodness.